This post is a break from my prayer posts. This post is In honor of National Pregnancy and Infant Loss Awareness Day, today. This post is my story. It's long and it was hard to write so I imagine it will be hard to read for some. But there's a point, so read it if you can. Back when such things were necessary, I learned that I'm terrible at taking my pill. I was only about two weeks in when I realized I was pregnant for a second time. After I told Aaron we freaked out for a good 2 days. Then we took some deep breaths, thanked God we hadn't thrown away the infant car seat, and started making plans. Hubs had been referring to this pregnancy as a "she" from the go, I called her Clementine and teased him that's what I would name her. We talked about moving, made plans to visit his family before the new baby was born (cross country travel with two kids under 2, no thanks), and we bought our son a "big brother" tshirt. At 6 weeks, after a visit to the park with my son, I started to feel sick, then there was indescribable pain, and after two hours of telling my husband that we would go to the doctor in a little while, my shoulder started to hurt. I remember getting to the emergency room and sitting in triage while they waited for a nurse to take me back. I remember the room getting dark and falling off the chair, I remember stumbling into the hall to ask for help and no sound coming out. I remember really truly wondering if I was going to die. I remember the ER nurse asking me questions questions questions and I just wanted her to stop. I knew what was coming and just wanted to be done with it, so I told her about the shoulder pain. She stopped writing mid sentence, and with a very deliberate calm clicked her pen, put it in her pocket and said in the most even of tones "Okay, let me just go confer with the on call doctor" and made calm, deliberate steps towards the door. I wanted to tell her it was okay, she didn't need to protect me, I already knew. I remember my husband being stunned, asking me why she just stopped and left like that, why she ran once she closed the door. I told him what most pregnant women know, in this situation shoulder pain isn't a good sign. The doctor ordered an ultrasound, just to be sure. I remember the tech crying and apologizing. I remember telling her not to worry, I remember touching her arm and telling her that it was okay. The pre-op nurses were the very definition of angels. They held my hand past the point where my husband was allowed to be, they whispered comforting things, dabbed at my eyes with tissues once the gas started to take effect and I couldn't move to wipe my own tears. And afterwards they were so quiet and kind, they let me cry and recover in peace with as little prodding and checking as possible. They admitted me for the night and they took me to my room, I heard the ER nurse cry as she gave report to the floor nurse when they thought I was asleep. In the days after I mostly remember how many people wanted me to process it in a certain way. For some people I wasn't sad enough, after all this was a child we lost. For some people I was too sad, after all I was only six weeks pregnant, most women don't even know by then. For some people I didn't talk about it enough, or only talked about the clinical elements or didn't share enough of the hospitals role or had too much guilt or not enough guilt. Some people didn't want to be confronted with this reality, to have to see my pain, and some people were far too inquisitive. One of the worst responses came from someone who told me it was tacky to have posted what was happening on Facebook the following day. She didn't give me the chance to explain how quick I'd been to share the pregnancy news, how many people already knew we were expecting because something like this was just unfathomable. They didn't give me the chance to explain that a one sentence Facebook post seemed less painful than having to tell all those people through individual conversations. Even that post didn't all the way work and for months after someone who knew and hadn't heard would ask how the pregnancy was, every time it was like stepping on a land mine while out for a stroll. She didn't give me the chance to explain any of it, just patted my arm, said she was sorry for my loss and said "although I do think it was awkward to post it on Facebook." Today is National Pregnancy and Infant Loss Awareness Day, which is the reason I shared my story, the long version, replete with details. Not to make anyone uncomfortable or to seek sympathy or pity, but because today of all days is the right day to share something important about my story. Today is the right day to share one simple thing for anyone who knows someone experiencing a loss of this kind or any lost at all: let them mourn in their own way, in their own time, on their own terms. I've talked to many other women since that day, women who have found themselves somewhere on this spectrum of loss and one theme runs through the experiences, very few were given the space to grieve in their own way, on their own timeline. I understand that it's hard to know what to say, especially at the loss of a child, and because of that we can so often feel awkward in the presence of grief. Something in our human nature is uncomfortable with other peoples pain, we hate not knowing what to say, we hate being reminded how fragile life is. Because of this we often stick to a script that at it's core is designed to make us feel better, not them. We try to control instead of comfort. But grief is a deeply personal thing, and how long it takes or how it manifests is not uniform. What's a healthy grieving process for you will be incomplete for me, and vice versa. I may not understand your grieving process and it might make me uncomfortable, but having been there I now understand that the best thing I could do is sit there, uncomfortable in your grief, and hold your hand, let you feel however you need to feel. I'm still incredibly thankful that I had a few friends, a few very sweet, wonderful friends, who did this for me. These people honored not only my loss, but they honored my grieving process. So today, on this day meant to bring awareness, that is what I ask you to be aware of. 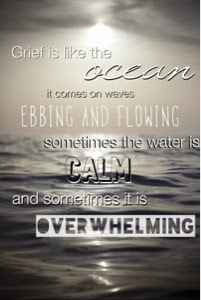 Honor the grieving process, let the mama grieve, try be comfortable with how it looks and how long it takes, even if it would be totally different for you. And if you can't be comfortable with it then at least don't try to control it. Let them grieve. The person who told me it was awkward that I'd posted on Facebook wasn't thinking about me, she was thinking about herself, about how awkward she felt seeing that blast of information. She wasn't thinking about me saving myself from having to have painful conversations with everyone I know. And I hope that someday she learns this lesson, and I hope that everyone else does too, before they become someone else's "they made it worse" story. For anyone who has walked this road know that my heart is with you today, and I'm so incredibly sorry for your loss.